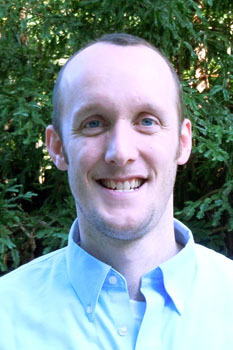 The Economics Department is pleased to welcome its newest faculty member, Assistant Professor George Bulman, who is joining the department this Fall 2013. George received his B.S. in Mathematics at Haverford College with a minor in Economics. He later received his Ph.D. in Economics at Stanford University where he was also awarded Outstanding Teaching Assistant. George's fields of interest include economics of education, public economics and labor economics. His job market paper, "The Effects of Access to College Assessments on Enrollment and Attainment" examines college enrollment effects of attending a high school that hosts a college assessment test center on campus. Because the additional cost of taking an exam at neighboring high schools is very small, standard economics models suggest that there shouldn't be an effect. To test if this is true, he constructs a new data set of every SAT and ACT test center in the United States and exploits within school variation generated by the opening of new centers over time. George's research paper, "Heterogeneity in Financial Incentives for High and Low Income School Districts" focuses on the reasons students who attend schools in low income communities have significantly lower achievement and make smaller gains than their counterparts in high income communities. We are excited to have George be a part of our team at the Economics Department.